Kerala homestay is a program promoted by Kerala Tourism Department, which allows tourists to Kerala, to live in a Kerala home and get to know the culture and lifestyle of this land in a better way. ‘Feel at home‘, is the concept which gave birth to the practice called Homestay. Tourists who travel and reach far away places always find it hard to get accustomed to the culture of distinct places. Living along with the natives, in their own houses and environment, helps travelers to know the lifestyle, language, cuisines, religion and every aspect of the local culture, in the best way possible. The Government of Kerala and the Department of Tourism are giving tremendous support to the concept of Kerala Homestay, as it helps to promote the rich and varied cultural heritage of Kerala. Initially, the non availability of homestays in Kerala was a major issue. 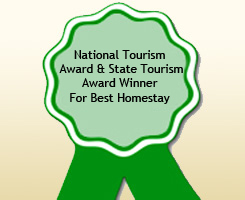 But thrust given by Kerala Tourism in promoting the concept of Kerala Homestays, helped to overcome this easily. A great advantage in this scenario was the high levels of education among Keralites. Kerala is a state with 100% literacy rates and it not uncommon that even people who are met on the streets understand and communicate in English. Now, the number and quality of homestays in various tourist locations of Kerala have increased to such a level that they match hotels and resorts. Coconut Creek, a typical Kerala Homestay which has bagged the award for the Best Kerala Homestay from Department of Tourism, Government of Kerala is the pioneer in promoting Kerala Tourism. It is a Kerala Govt. approved Homestay, accredited with the highest ‘Diamond House' rating . The Coconut Creek, Kerala Homestay provides an inimitable service that sets it apart from others. This exquisite homestay is located in Kumarakom, one of the top tourist destinations in Kerala, which is situated in Kottayam district. Beside the Coconut Creek is the famous Kumarakom Bird Sanctuary, which is an abode of many species of migratory birds. The rich flora and fauna of Kumarakom will dwell you to the divinity of nature's beauty. Draped in the beauty of the Vembanad Lake , lagoons and backwater canals, Kumarakom is blessed with nature's finest and serene vista. The Coconut Creek, the Kerala Homestay has a wide array of distinct features. The main attraction is that it lies next to the famous Kumarakom backwater creek. That itself makes it distinguishable and attractive. Coconut Creek can be called a true Kerala Homestay, since it is located in a village, on 4 acres of land filled with typical Kerala crops like coconut, mango, banana, jackfruit etc. Our Kerala Homestay consists of three well furnished rooms which are fully air conditioned with attached bathrooms. Luxury-laden rooms, Kerala's traditional cuisine, Kerala tea shop are the salient features of this Kerala Homestay. It also has dining rooms, living rooms, surrounded by verandah and a private sit out for each room. All these amenities are bound to create a feel that you are not far away from home. It gives complete relaxation and rejuvenation for the travellers after their long journeys through out the day. Coconut Creek also provide house boating facility to the guests through the Vembanad Lake , which is renowned as the longest lake in India . It is also the largest lake in Kerala. In monsoon season, the guests are lucky enough to watch the famous Nehru trophy boat race which occurs at Punnamada in the Vembanad Lake . Coconut Creek also offers travel facilities to the guests. These features altogether make Coconut Creek, a perfect homestay at Kumarakom, with high-end facilities yet affordable. It can never fade out from your memories as it is seen only in the greenish lush of Kerala, the God's Own Country. Coconut Creek's added on feature is that we have a separate travel wing which is operating from Kumarakom and Kuwait . It conducts several activities like tour and holiday or vacation packages in Kerala, taxi rental, Ayurveda massage treatments, hotel reservation in different destinations like Cochin, Munnar, Thekkady, Kuttikanam, Kottayam, Kumarakom, Alappuzha, Varkkala, Kollam, Thiruvananthapuram, Kovalom, Wayanad, Kanyakumari and many more wonderful tourist destinations in Kerala. 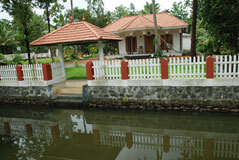 Coconut Creek, the Kerala Homestay has several features different from other similar places. Another major advantage is that many other tourist spots are lying adjacent to it. So it will be easy for the guests to reach their desired destinations at the earliest. All the assistance required will be provided by the well educated and good mannered members of Coconut Creek's family at any time. In the vivid beauty of nature blended with the welcoming breeze of the Kumarakom Lake, Coconut Creek, gives freshness through out the day you spend here. While returning from Kerala you will surely carry along a bunch of memories about this sweet Homestay, which you will always love to cherish.